Animals, coyote sized or smaller, should not be skinned unless by a professional. Don't gut the animal. Small mammals, especially carnivores, will spoil quickly because of their thin hide and bacteria. If you can't take the small game animal immediately to our studio, as soon as the carcass cools completely, put it in a plastic bag and freeze it. Do not gut the bird. Rinse off any blood on the feathers with water. Take the bird immediately to our studio or freeze it. Put the bird into a plastic bag for freezing being careful not to damage the features, including the tail. If the bird's tail fathers do not fit in the bag do not bend them. Let the tail stick out of the bag and tie the bag loosely. Do not gut your fish. If you cannot take your fish immediately to our studio, borax thoroughly and put it in a plastic bag, making sure all the fins are flat against the fish's body (to prevent breakage), seal tightly, and freeze. A fish frozen with this method can safely be kept in the freezer for a few weeks. Note: A fish will lose its coloration shortly after being caught. A good color photograph immediately after the catch may enable our artists to duplicate the natural color tones of that particular fish. 1. 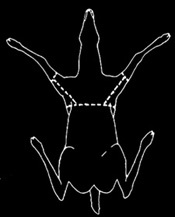 With a sharp knife slit the hide circling the body behind the shoulder at approximately the mid-way point of the rib cage behind the front legs. Slit the skin around the legs just above the knees. An additional slit will be needed from the back of the leg and joining the body cut behind the legs (Figure 2A and 2B). 2. Peel the skin forward up to the ears and jaw exposing the head/neck junction. Cut into the neck approximately three inches down from this junction. Circle the neck cutting down to the spinal column. After this cut is the head off the neck. This should allow the hide to be rolled up and put in a freezer until transported to our studio. These cuts should allow ample hide for the taxidermist to work with in mounting. Remember, we can cut off excess hide but he can't add what he doesn't have. 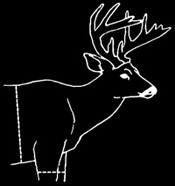 There are two major methods of skinning for a large life-size mount such as deer, elk, or bear. These methods are the flat incision and the dorsal method. We recommend the flat incision. Our studio is equipped with a drive through bay and full time skinner on staff. We will cape your trophy and prepare it for the butcher at no additional cost while you wait. Always have appropriate tags with your trophies when you take them to our studio. Do not cut the ears for attachment. Songbirds, Eagles, Hawks, and Owls are protected by Federal Law and cannot be mounted unless with special Federal permit. For situations where you are hunting with no available taxidermist or freezer, contact our office about techniques to skin out the entire cape (including the head) and salting the hide. This is the only method in remote locations that can preserve your hide for later mounting.